Taking a page from the Saatva business model, this company only sells its mattresses through its website. This means that they reconfigure the entire normal supply chain and cut out a lot of the costs involved in running a normal retail mattress store. Think about utilities, rent, and all the other high costs that most mattress companies have to incur. 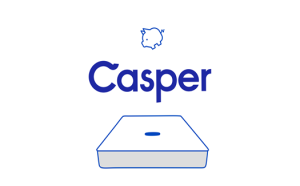 Casper doesn’t have to incur any of them, and that is the key reason why they are able to provide a product that costs much less than a comparable product at a retail store. The business model works in many other industries, and I see it working quite well in the mattress industry too. The price of a queen Casper mattress is $850 with free shipping. If you step into a mattress store, you are probably going to be overwhelmed by the number of choices you have. You’ll be able to mix and mash different types of layers, different firmness levels, etc. Research shows that consumers are generally put off when they have a whole bunch of options. Casper had this in mind when it decided to make their offerings incredibly simple: you basically have one choice only. They feel that they have created the perfect mattress and didn’t want to inundate people with too many choices. I think this is a great idea and probably adds to how they can offer such a great price. Most people don’t have a great idea of what they want when buying a mattress and are confused by all the different terms the industry throws out. Casper cuts out all of the noise with their offering. The return policy seems very favorable. As an online-only company, they have to provide a favorable policy to alleviate any fears people may have about buying a mattress online, especially without being able to try it out first. Their policy is pretty simple: try the mattress out for 40 days and return it with no hassle if you don’t like it. Very customer-friendly stuff. A big draw for Casper is their free shipping. This keeps the price tag down low and means the value of the mattress overall is that much bigger. In e-Commerce, everybody loves free shipping, so I’m glad that they are able to do this. Another cool thing about shipping is they are able to compress the mattress into a small box that can fit through any door. This makes the whole delivery process much easier (this reminds me of IKEA’s flat-pack delivery, although the Casper mattress is much easier to assemble, haha). 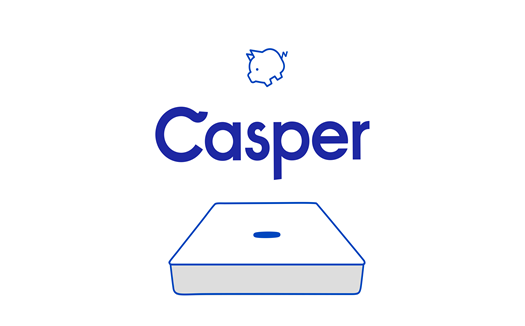 The Casper mattress combines the benefits of memory foam and latex. It has a memory foam layer below a top latex layer. The memory foam layer allows the mattress to contour to your body, while the latex layer cools the bed and provides an extra level of bounce. The company describes the bed as a “luxurious marriage of latex and memory foam.” After testing it out for a few days, I can say that the sleep experience is fantastic. It does provide a great balance between comfort (probably from the memory foam component) and support. It doesn’t sag too much, which is something I really like. It’s a really great overall experience. Everything is hand-made in the USA as well, with operations in South Carolina, Illinois, and Georgia. It’s impossible to say how the mattress will hold up over time (because the company is brand new), so that’s really the only question mark I would have at this point. The mattress has also been constructed to be a little on the firm side. While I thought it felt great, for those who like a really soft mattress, Casper may not be the right fit for you. One drawback is not being able to try the mattress out first. I don’t think this is that big of a deal, and if you are willing to take a small risk, I think you will be rewarded. Some, however, may have complaints about not being able to try it. The other potential drawback is the lack of choices. If you are an educated consumer, you may have an exact idea of what type of mattress you want. Casper then may not provide exactly what you are looking for. I can assure you, however, that the average person will really enjoy the Casper mattress. While this could be a source of potential complaints, it could also easily be seen as a big benefit. The other potential drawback stems from the company being so new. We don’t know yet how durable the mattress will be. The materials are very solid, so I think this won’t be an issue, but it’s something to consider. I love how different this company is. They make things very simple and provide a luxury product at a very affordable price. If you are willing to take a small risk, I think you will be greatly rewarded by getting a Casper mattress. We are proud to have provided one of the first Casper mattress reviews and hope you have found this helpful. Check out the Reverie mattress review page. Hi! We’re considering a Casper vs a Loom & Leaf mattress for our next purchase, OR a W Hotel Bed (plush top). Which would you recommend? We’ve been on a crappy IKEA mattress for 5 years now and it’s time is up. Looking to upgrade to something more comfortable and more luxurious. W Hotel is definitely a bed everyone likes (hotel beds are made to please as many people as possible, naturally). However I think you’re going to pay a premium buying it. Casper and Loom & Leaf both have the direct to consumer model, so they can offer more value than the average company. Loom & Leaf feels like traditional memory foam, Casper feels more like a latex mattress (top layer is latex). Loom & Leaf is more expensive as well, but generally in the same range. I think between the two the biggest differentiator is the feel. If you like the feel of the Ikea mattress (but want an upgrade) I suspect that Loom & Leaf will be a more direct comparison.